Director Karyn Kusama exposes facets of Nicole Kidman and Los Angeles we’ve never seen before in this dark, gritty and unconventional thriller. 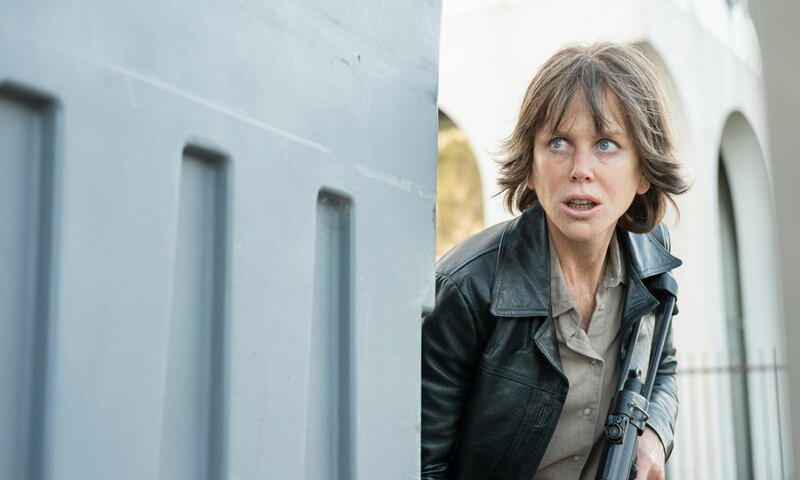 If you didn’t know Nicole Kidman was playing the protagonist in Destroyer, you’d be forgiven for not immediately recognising her. The film opens with a close-up of her face as her character, Erin Bell, is woken from a night in her car. Red-rimmed, alcohol-bleared eyes and parched skin blotchy with sun-damage – this is a transformation akin to Charlize Theron’s role in Monster. But Kidman’s portrayal of anti-hero Bell is far more than skin-deep. She inhabits the role to the bone. Every gesture, from skittish lack of eye contact to her world-weary gait and ease with her gun, speaks volumes about this hard-as-nails detective and the damage she’s been carrying since an undercover investigation went off the rails 17 years ago. The opening minutes see Detective Bell stagger from her car to a murder scene, seemingly still drunk from the previous night and totally indifferent to her police colleagues. As she mutters about someone called Silas, all we know is that an extremely dangerous and significant person from her past has resurfaced and she intends to bring him to justice. From this point, two narratives spin out. There’s Bell’s present-day hunt for her nemesis, bank robber Silas (Toby Kebbell), interspersed with a second timeline which unspools the mystery of what happened 17 years ago to transform Bell from a fresh-faced FBI cadet into the gritty and psychologically damaged LAPD detective she is today. Through the clever drip-feed of the secondary storyline, we learn that Bell and her FBI partner Chris (Sebastian Stan) infiltrated Silas’s gang of bank robbers but the undercover operation went drastically wrong, resulting in Bell losing Chris, who had become much more to her than a work colleague. She’s still carrying a crushing sense of guilt, an implacable desire for revenge and a dysfunctional relationship with her 16-year-old daughter Shelby (Jade Pettyjohn). Director Karyn Kusama is well-known for her gritty female protagonists, casting women in tough, unlikeable and morally complicated roles that are usually reserved for men, particularly in this genre (she made her big-screen debut with the award-winning Girlfight in 2000). She outdoes herself with this film, combining brilliantly evoked, complex characters with a clever structure and cinematography that underscores the themes by highlighting the bleak and ugly underbelly of Los Angeles. This film achieves far more than the conventional thriller. It delivers the excitement, but Kusama’s brilliance is that she’s managed to simultaneously create a character study of how trauma and guilt can turn cancerous and eat away at a person until only the husk is left. Kidman’s total embodiment of this character is staggering. You could see this film just for Kidman with crow’s feet, but I suspect you’ll walk out impressed by far more than the prosthetics.